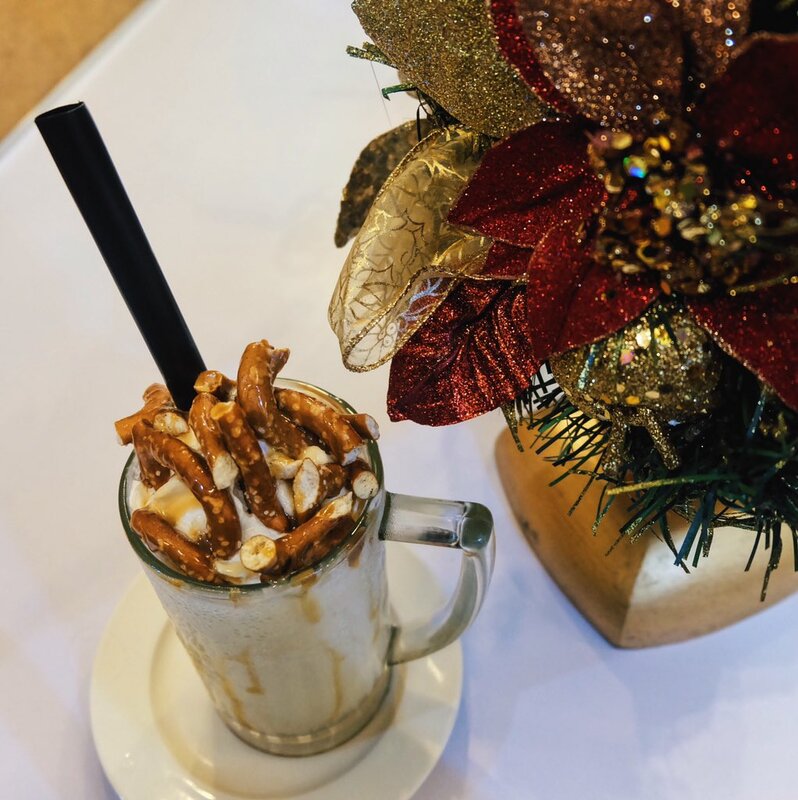 It's just days before Christmas and I started my celebration by visiting Café 91. This café is located at Glam Theme Boutique (GTB), fronting Tapsi Terminal along Magsaysay Avenue, which makes it a very convenient stop to "Shop, Dine, and Chill." Update as of January 8, 2017: They have moved to a much bigger home - 2F Avenue Square, Magsaysay Ave. Naga City. The above photos are some of their original flavors: the Death by Sweets (left) and the Cookie Monster (right). For those who have the ultimate sweet tooth, the Death by Sweets would be your best friend. 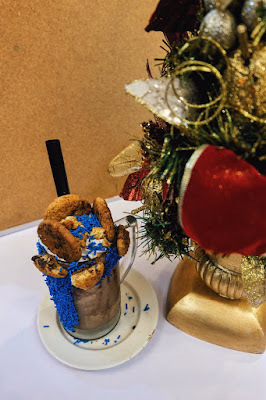 This is a chocolate shake drink topped with two donuts, cookies, choco coated pretzels, choco dipped cones, and a lot of sprinkles. 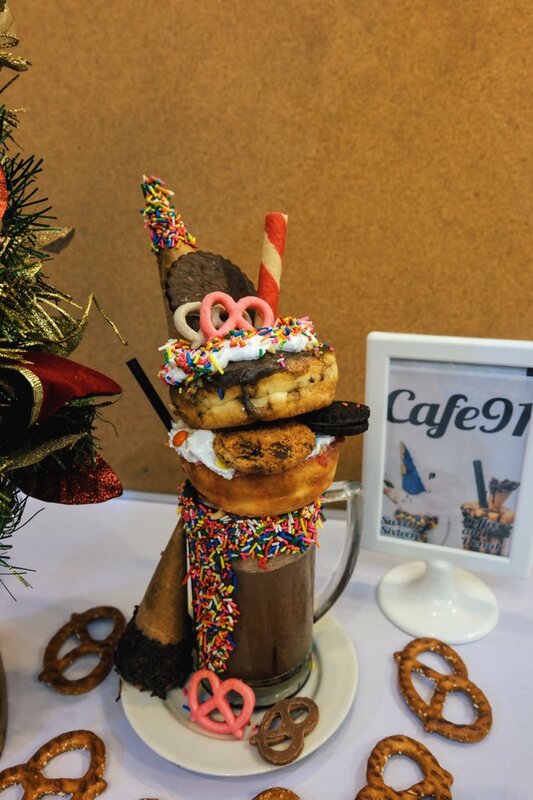 The drink itself towers at about 12 inches! Yeah right, that's a total wow moment for me too. Haha! 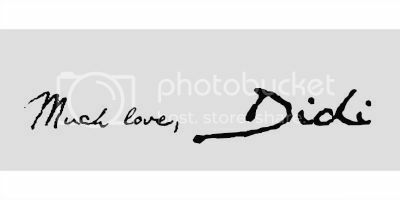 This can be shared by two persons, but I know some of you can finish this by yourselves. Haha! 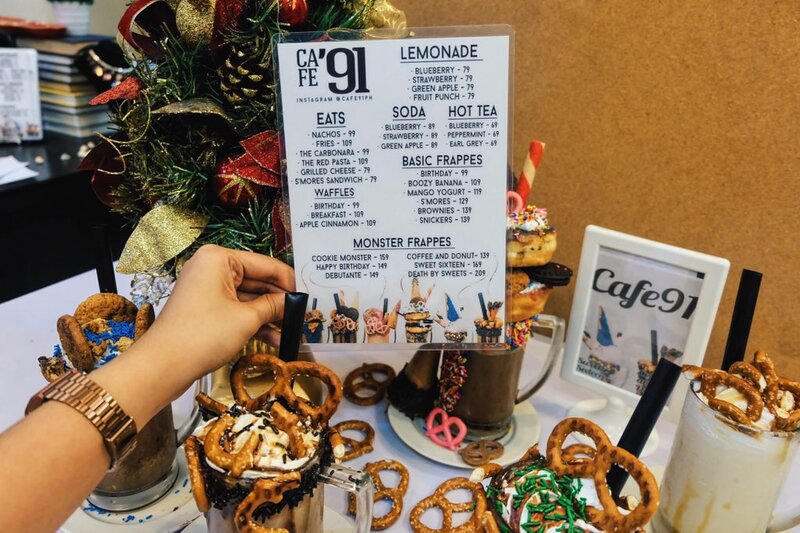 Café 91 also offers quick snacks, waffles, hot tea, sodas, and lemonade. What I love about them is that they continuously offer something "new" to the crowd - they conceptualize their frappes based on the current trend or celebration. 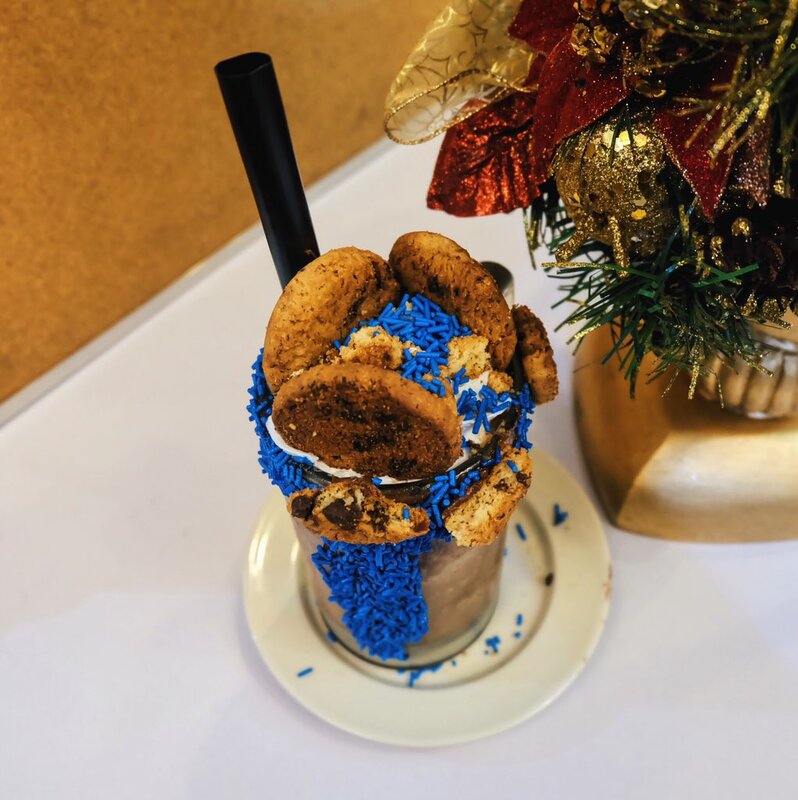 Some of their most creative concepts are the Peñafrancia Frappe last September and the Pokémon Go flavors during the hype of the famous game app. 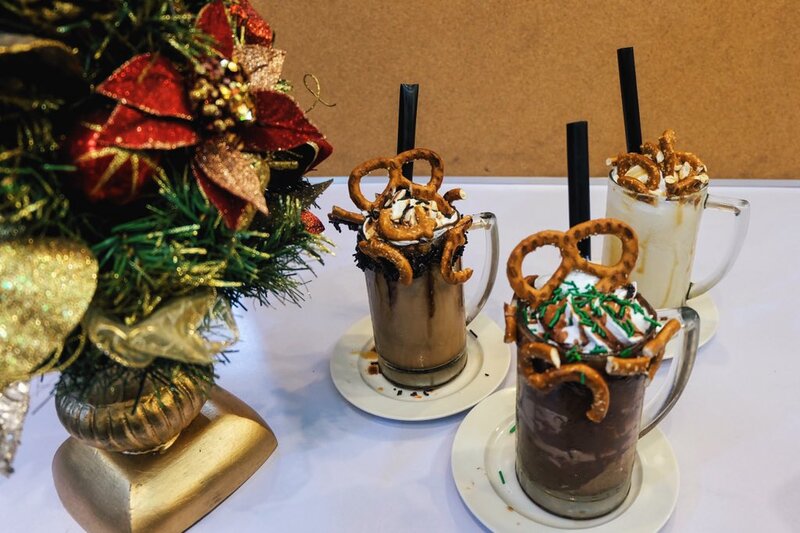 To live up to what they are known for, Café 91 launched their Holiday Frappes for the whole month of December (above photo from left to right): Santa's Favorite - a Hershey chocolate flavored drink, White Christmas - vanilla based flavor, Minty Mornings - chocolate drink with a hint of mint, and The Grinch (not in photo) which is a matcha based frappe topped with matcha Kitkat and matcha crinkles. 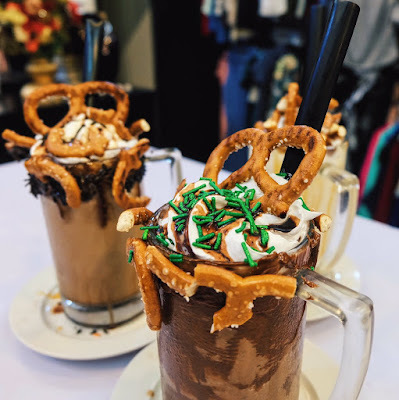 Being a lover of chocolate mint, you can guess what my favorite is from the Holiday Frappes. Minty Mornings just have the right amount of mint to complement the sweetness of the chocolate milkshake. 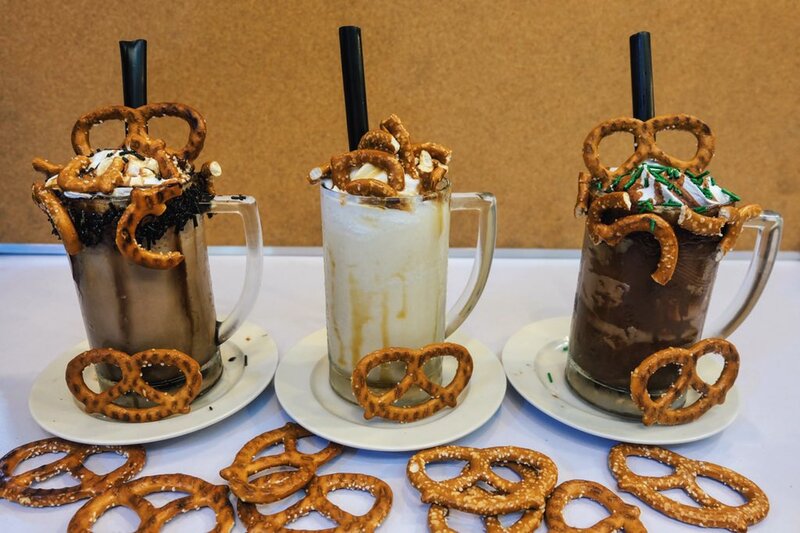 The salted pretzels toppings also make it fun to nibble on while finishing the frappe. Overall, I'm completely satisfied! 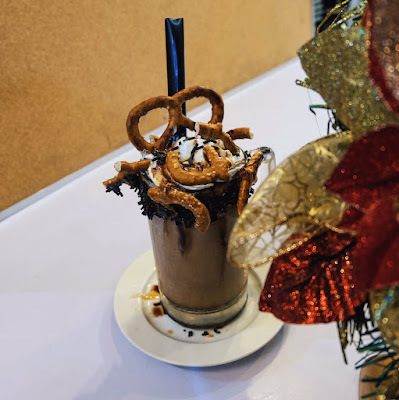 Café 91 can be a bit pricey especially for students but it's a perfect way to treat yourself for a sugar rush once in a while. Daily business hours is from 10AM up until 10PM. 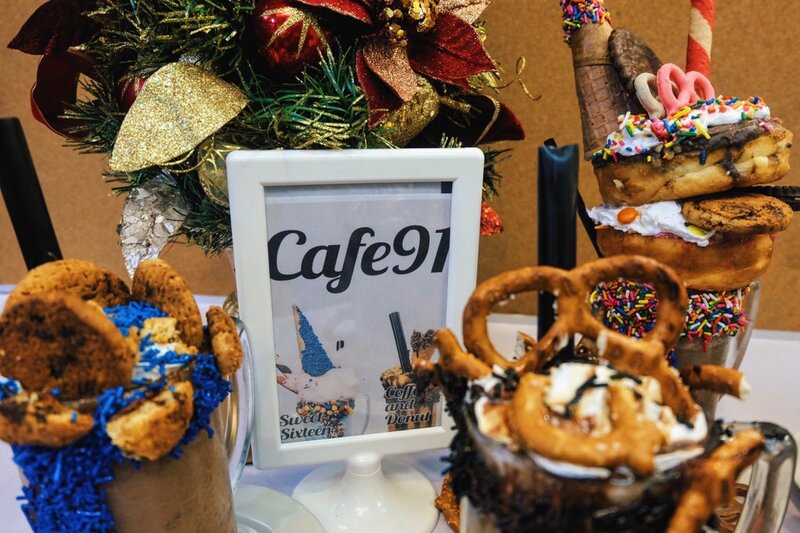 Have you visited Café 91 yet? If yes, let me know your experience on the comment section below.